Scientific name: Prunus mume Sieb. et Zucc. Native to China and Korea, where it has been cultivated for 1500 years, and long known in Japan where it is highly valued as an ornamental, Prunus mume was introduced to Britain in the mid-nineteenth century when some double-flowering Japanese cultivars were imported. However, it wasn't until the end of the century that it became established in cultivation. Even today, the eighth edition of W.J. Bean's Trees and Shrubs Hardy in the British Isles, after describing the tree's virtues, notes that it is uncommon and listed only by a few nurserymen. The relative inattention paid to this remarkable tree by the gardening world becomes difficult to understand when you look at the tree itself. At 20 feet it is an ideal size for small gardens or a fine accent for larger landscapes. In late spring and summer, handsome dark green foliage, dramatically colored, dark green stems and a pleasant rounded habit distinguish Prunus mume. 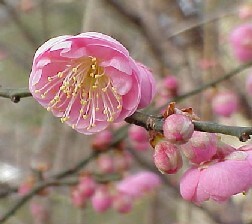 Prunus mume species may be propagated from seed extracted from ripened fruit. Stratify in plastic bags filled with a moist mixture of one-half milled sphagnum moss and sand for three months in the refrigerator, and then sow outdoors in spring or in the greenhouse any time of year. For cultivars true to form, you'll have to propagate from softwood cuttings taken in early summer and kept misted. Prunus mume can also be grafted by T or chip buddings with buds from soft or semi-hard wood onto the more available purple leaf plum, Prunus cerasifera, understock. Prunus mume will flower in three years from seed and in two from grafts. The tree grows quickly when young, three to seven feet per year, except for the contorted varieties which are slower growing. Aphids cause distortion of new growth, deposits of honeydew, and sooty mold. Borers attack stressed trees. Keep trees healthy with regular fertilizer applications. Scales of several types infest the cherries. Horticultural oil is used to control overwintering stages. Spider mites cause yellowing or stippling but they are very difficult to see. Tent caterpillars make large webbed nests in trees then eat the foliage. One defoliation may not be serious and small nests can be pruned out and destroyed. Use Bacillus thuringiensis when the insects are first seen and are still small. Diseases No diseases are of major concern. � 'Matsubara Red' Double dark red flowers and red new growth turning green.